Master Recharge API Market Segmentation by Service type - Prepaid Mobile Recharge, Postpaid Mobile Recharge, Data Card, DTH, Electricity, Insurance, Others - Gas, Other Utilities etc. The retail payments industry is witnessing significant technological advancements across the world. Retail industry has seen introduction of upgraded recharge and billing technologies, due to developments across the telecom industry, and proliferation of online banking or online payment technologies, with master recharge API being one of these technologies. With focus on convenient, easy go online recharge, and utility billing payment, the master recharge technology has been introduced to the end-use market. The market for master recharge API is forecast to reach US$ 16,159.3 Mn by 2026 from US$ 10,279.4 Mn in 2017, recording a CAGR of 5.2%. The master recharge API market has witnessed significantly increased demand due to growing number of smartphone users and increasing adoption of online payments across the world. Master recharge API for prepaid mobile recharge leads the recharge API service segment, followed by DTH recharge service. Master recharge API usage for utility billing application is in an embryonic stage; hence the utility billing service segment was observed to contribute less in 2016. However, the segment is anticipated to experience remarkable growth by 2026. Though online payments and smartphones are highly popular, enjoying strong acceptance among industries and consumers, master recharge API is anticipated to see slower adoption. 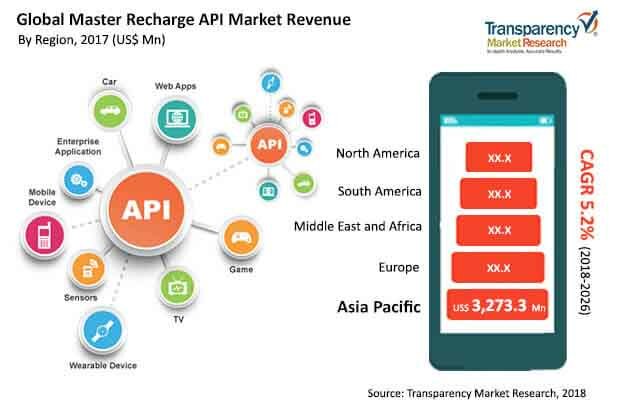 A study of recent solution launches and developments of key industry participants active in the market reveals that master recharge API services which includes prepaid mobile and DTH would continue to dominate the market throughout the forecast period. Further, utility services such as electricity, and gas bill payment are expected to witness remarkable growth in the near future, across markets globally. These attributes would show further improvement in recharge API acceptance in end-use markets. Moreover, dip in solution or service charges and introduction of low ticket easy recharge options by telecom/digital service providers is expected to drive rise in volume of transactions. This in turn is expected to favorably impact the recharge API market both for master vendors and channel partners. Factors such as improvement in consumer spending on internet services and telecom prepaid services is observed as crucial parameters influencing the market growth. The master recharge API market however still faces challenges such as security concerns and issues associated with e-payments, which has negatively affected further large scale proliferation of technology. Any further development, exploration of internet applications and growing presence of retailers, distributors, white labels companies, and API integrators are expected to open new set of unmapped opportunities, thereby supporting the growth of the master recharge API market. The global master recharge API market is expected to witness steady growth during 2018 – 2026. Substantial number of existing mobile subscribers across the Asia Pacific region is anticipated to generate maximum revenue for the master recharge API market over the forecast period. Europe is anticipated to follow a similar trend during 2018 – 2026. Middle East & Africa is forecasted to witness highest CAGR growth after APAC. Attracted by this steadily expanding market and underlying embryonic demand, many players are driven to invest in the market for master recharge API solution and services. Right from platform/software developers to integrators and professional service providers across industries are strengthening their position in the master recharge API market. CyberPlat is creating a competitive atmosphere for master recharge API markets. However, with competition from established players such as Jolo, Euronet Worldwide, Inc., and Crowdfinch which already have technology expertise and a strong network in the market, new entrants may find it challenging to establish themselves without a unique value proposition. Some of the prominent players identified in the master recharge API market and profiled in the study include - Axis Softech Private Limited, Recharge Handa (Handa Enterprises), Indian Web Technologies (P) Ltd. (IWT), Pixyrs Softech, Pointersoft Technologies Pvt. Ltd., MyRecharge, Xtracare IT Solution, LBS Software, and Cyrus Technoedge Solutions Pvt. Ltd.